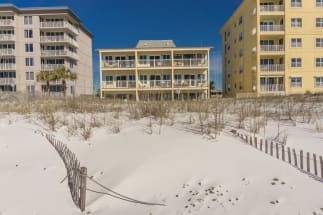 Bella Riva is a Gulf front condo complex nestled in the sand on Okaloosa Island in Fort Walton Beach, Florida. These vacation condos offer unbeatable views of the emerald waters and white sandy beaches. Start your morning relaxing on your private balcony with coffee while you watch the sunrise. The balconies are 10 x 45 feet which provide plentiful space for the entire family. The Bella Riva was specifically designed with vacationers in mind. Bella Riva would make a great vacation destination for a family getaway, couples retreat or snowbirds looking for someplace warm in the winter. Bella Riva is filled with high-class amenities. The condo complex offers a beachfront pool and hot tub, an incredible fitness center, and wireless internet. The beach is just steps from your condo door. The Fort Walton Beach area and Destin are both within just a few minutes drive from the complex. Both areas offer endless dining and shopping. There are also several fishing charters in Fort Walton Beach and along the Destin Harbor. Deep sea fishing and bay fishing provide an endless day of memories! You can book Bella Riva Condos on Emerald Coast By Owner. Each listing will contain an Email Owner button and Phone Number for your convenience. Listings that are labeled with Book Online you can book online by selecting your dates on the calendar.